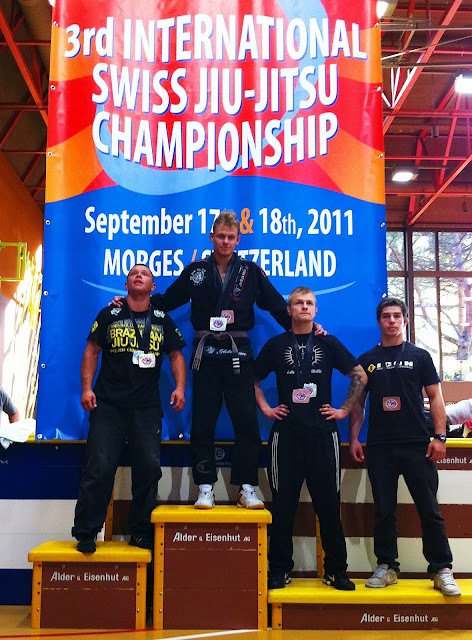 Zhoozhitzu do Graugardo: Three matches at Swiss Open in Geneva, Switzerland. Three matches at Swiss Open in Geneva, Switzerland. 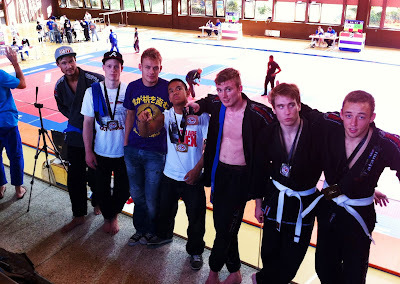 This weekend, I went with some of the guys from the team (haven't yet decided if we are "Team Madness" or "Team Teabaggers" this year) to Switzerland to attend the first competition of our busy fall. 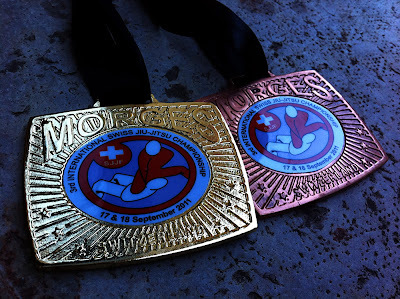 Everyone performed really well, and we ended up with a total of three gold, two silver and two bronze medals. I feel like talking a bit about the event first... Switzerland is a beautiful place, and I had been looking forward to check out some alpes, maybe even walk up to the top of something. According to the time schedule of the tournament, it looked like we would finish already around 12-13 both days, which would leave us plenty of time to go check out lederhosen-land. Unfortunately, the tournament looked good, but was poorly organized. And now to the matches themselves! First match was against a french guy in the middleweight division. I didn't feel any nerves or anything before the fight. Only had a few minutes from my division was called to the match was on, so didn't really got to warm up. He pulled guard and I was happy to play top a little until he caught me a few seconds later with a nice x-guard sweep. He had trouble passing my guard (succeeded once), but I had even more trouble sweeping him, so he ended up winning 5-0. He scored with x-guard from bottom and passed when I tried x-guard. I thought that was one of my strong moves, but apparently not LOL Pretty nice moves he caught me with though, I will steal them right away for my own game. Physically, he was far superior and I felt like his base was too good and he didn't make any mistakes, that I could take advantage of. Very strong opponent, that went on to win the division. He would probably beat me 10 out of 10 times that day. I got a bronze medal for my amazing performance. Second match was in the open weight division against the winner of the -70 kg division. I had seen him compete early and he looked skilled. He was wearing a polish judo jacket, so I decided to pull guard pretty quickly. This time, I had a size advantage and I also felt I was a step ahead technically. Was pleased to do a good attempt on a guillotine from halfguard top, that I have been working a lot on. He was really difficult to put on his back and hold down, but I eventually managed to finish him with one of my favorite chokes from the back. 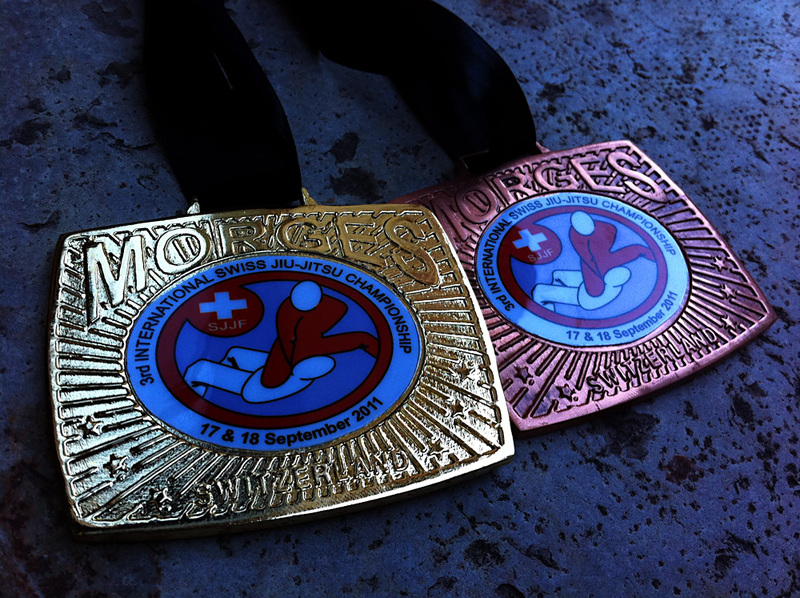 Third match was the final in the open weight division against the winner of the -88 kg division. He was a nice guy I had a good chat with before the match. Big, heavy and strong, but I felt like my cardio was better than his. He fell for the same sweep a few times and I scored a bit with that. It was a good, tough back-and-forth match and I didn't feel like the victory was safe at any point, even though I was slightly ahead on the scoreboard. Had a few attempts on guillotines and loop chokes that were really tight, but lacked leg-position due to his base and weight. At one point I have a tight guillotine that I decided to give up sweep and guardpass for, but end up releasing to save grip energy. I caught a triangle choke from a guard recovery and got the tap. - Headhunting project, looking for guillotines and loop chokes is improving. congrats! Match 3 -- That was some sick, sweet sweeping!! Please please do a tutorial on that. Was pleased to do a good attempt on a guillotine from halfguard top, that I have been working a lot on.